Nationally and internationally recognized faculty guide your creativity. The Bachelor of Fine Arts (BFA) degree program is for students interested in art as a profession. In the BFA, you will develop a foundation of attitudes, traits, and abilities required for a lifetime as an artist. Emphasis is placed on using your personal experiences as the source of artistic motivation. The broadly based liberal studies curriculum provides a diversified background which, in concert with professional training, will lead to a successful career in art and applied art vocations. You should choose the Bachelor of Fine Arts if you are interested in pursuing a career in art. The BFA is a professional degree with in-depth coursework that provides a foundation for you to develop key artistic attitudes, traits, and abilities with which to begin a lifetime as an artist. Your progress to becoming an artist will be propelled by the life experience you bring to the program. The Art Department fosters a creative learning environment filled with opportunities for you to advance technically and conceptually, while gaining a broadened understanding of historical, theoretical, and cultural context relevant to art and art-making. Because the program is a general BFA, you will become familiar with a variety of media and materials. However, you also have the opportunity to choose a more focused program of study and explore one discipline over others. The curriculum provides a diversified background required for a successful career in art and applied art vocations. Upon graduation, you will have developed the traits and abilities of an artist. You'll be adept at visual and written forms of communication. Your technical expertise will match your ideological levels, and the quantities of work you produce will represent time spent and successful understanding of studio techniques. Throughout your study as a BFA major, you'll continue to develop a direction, medium, idea, and/or style. You will also learn to place art within the larger cultural and historical context and to apply this knowledge of art history to better understand, evaluate, and engage in art making. Our alumni have diverse employment experiences in art and art-related fields. Students who complete the BFA program are prepared to succeed in a variety of workplace environments, where problem solving, creativity, critical thinking, attention to detail, time management, and a strong work ethic are highly sought after. 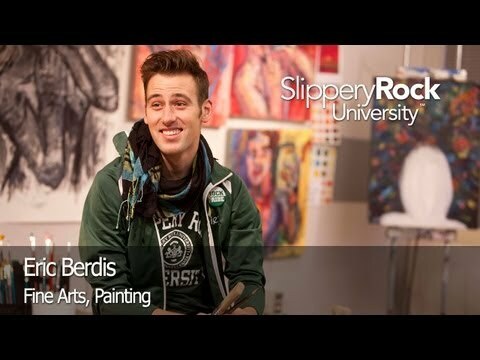 Eric is a senior Art major, focusing in the area of painting at SRU. When he transferred to Slippery Rock University, he lived in the HFPA LLC-Living Learning Community, and he describes how that helped him transition to life at SRU. He talks about how the Art department and the faculty have helped him learn about his major in several different aspects. Eric is presenting his artwork at the senior showcase.